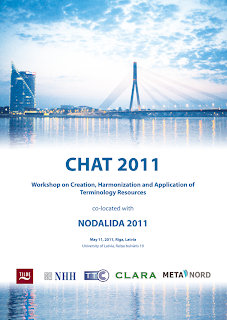 I was delighted to have the honour to lead the first CHAT workshop on creation, harmonization and application of terminology resources held on May 11, 2011 at the University of Latvia, in Riga, Latvia. 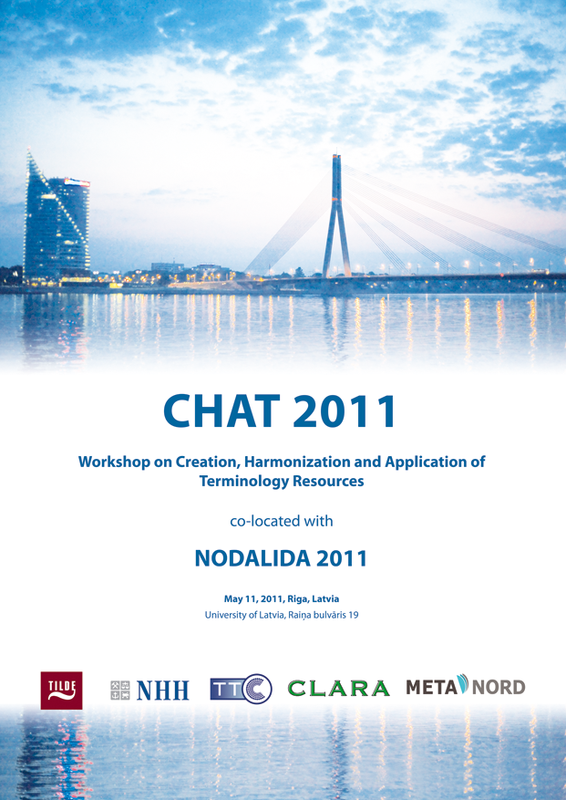 It was co-located with the 18th Nordic Conference of Computational Linguistics, NODALIDA 2011. Terminology plays an extremely important role in the translation and localization industry, as well as in natural language processing. Different national and international activities have been undertaken to create terminology resources and apply them in computer-assisted and machine translation tools (e.g. TTC: Terminology Extraction, Translation Tools and Comparable Corpora). Another issue is the consolidation and harmonization of dispersed multilingual terminology resources. An important step towards this direction is the federated approach of providing access to content from multiple data sources, such as EuroTermBank, as well as international activities of providing common language resources and their applications CLARA and open linguistic infrastructures (META-NORD: Baltic and Nordic Branch of the European Open Linguistic Infrastructure), to serve the needs of industry and research communities in language resources, including terminologies. The main idea of CHAT was to focus on the fostering the cooperation between the European projects and research and development activities in the area of terminology, and bring together academic and industrial researchers, as well as attract and involve postgraduate students and young researchers. Two invited speakers kindly accepted our invitation to give their keynote presentations. They were Prof. Gerhard Budin (University of Vienna, Austrian Academy of Sciences) and Prof. Emmanuel Morin (University of Nantes, Computer Science laboratory of the Nantes-Atlantique region of France). Prof. Gerhard Budin gave a keynote presentation on “Terminology Resource Development in Global Domain Communities” with an overview of “Practical Experiences, Case Studies and Conclusions for Future Projects”. Prof. Emmanuel Morin gave a keynote presentation on “Bilingual Terminology Extraction from Comparable Corpora”. We had two paper presentation sessions (9 papers) and a demonstration session (2 demos). Overall, the workshop was truly multilingual, multicultural and multidomain! I hope the participants found the workshop interesting and useful for their further research in the development of terminology resources and services of the future, had fruitful discussions and revealed promising perspectives, and simply spent nice time during that day. CHAT proceedings were published in the electronic repository of the University of Tartu Library as NEALT Proceedings Series vol. 12 and can be found at http://dspace.utlib.ee/dspace/handle/10062/16956. There are 12 files in the volume: 11 papers as separate files + one file (Proceedings) that contains contents, preface, program of the workshop and all the 11 papers. CHAT 2011 in pictures: https://picasaweb.google.com/115946514697851463753/CHAT2011?feat=directlink, the quality of the photos leaves much to be desired, but still it’s better than nothing. On behalf of the workshop organizing committee I would like to express our gratitude to the NODALIDA conference for this opportunity to co-locate the workshop as a satellite event. The University of Latvia for hosting this workshop and the Institute of Mathematics and Computer Science, in particular, for their cooperation and efforts during the workshop organization. The invited speakers for their responsiveness and substantial input to the programme. Co-organizers of the event for our close collaboration and Programme Committee members for their time and attention during the preparation of the workshop and review process, in particular. All the participants for their interesting papers and presentations. My colleagues from Tilde for their assistance, advice and support! Prof. Mare Koit, Editor-in-Chief of the NEALT Publication Series at University of Tartu, for her cooperation and producing the electronic proceedings.